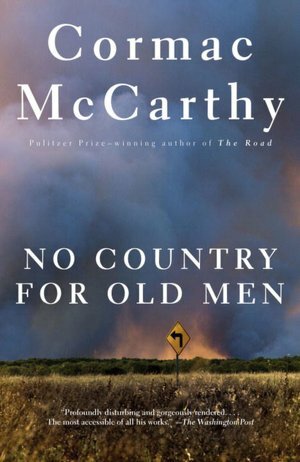 After being completely blown away by The Road, I decided that I should add another Cormac McCarthy title to my reading list. So several weeks ago, while perusing row upon row of books at Borders, I picked out a copy of No Country For Old Men. This should be good, I thought. And it was. I deeply admire McCarthy’s writing style. He has a way with words that is nothing short of breathtaking. In The Road, he relied heavily on description, and successfully created the most realistic post-apocalyptic atmosphere I’ve ever encountered in a novel. But his approach in No Country For Old Men is quite different. In this case, his writing has the ferocious, unrelenting force of an incredibly intense screenplay. As one critic noted, the book cuts “from one frightening, violent set piece to another with cinematic economy and precision”. When a good old boy named Llewelyn Moss stumbles upon a bloody crime scene with $2 million and a load of heroin, in the middle of a Texas desert, he takes the cash. He’s forced to flee his home, however, when Anton Chigurh – a cold-blooded, methodical killer – comes looking for it, with sheriff Ed Tom Bell hot on his trail. As Moss tries to evade Chigurh, he ends up unleashing a violent chain of events that not even the law can contain. The villain, Chigurh, is evil – frighteningly evil. There’s really no other way to describe him. He kills, and he does it efficiently and remorselessly. A trail of bodies follows him wherever he goes. And that’s his way of life. Then there’s Lewellyn Moss – he’s the guy in-between. Initially, he thinks he can take money that doesn’t belong to him, and get away with it. But he’s woefully mistaken, and when he realizes it, he embarks on a desperate attempt to escape the consequences. The stories gets passed on and the truth gets passed over. As the sayin goes. Which I reckon some would take as meanin the truth cant compete. But I dont believe that. I think that when the lies are all told and forgot the truth will be there yet. It dont move about from place to place and it dont change from time to time. You cant corrupt it any more than you can salt salt… I’m sure they’s people would disagree with that. Quite a few, in fact. But I never could find out what any of them did believe. If that’s not hopeful and redeeming, we must not be reading the same thing. Do you expect God knows what’s happenin? Bearing this point in mind, I do think the book deserves to be read. It will stick with you, and give you plenty to chew on long after you’ve turned the final page. I highly recommend it, with the caveat that it certainly isn’t for readers younger than 16. No Country is a disturbing book, with quite a bit of graphic, bloody violence and a fair amount of language. Not light reading, by any means. But worthwhile reading, nonetheless. Think I will pick this up soon.